Five…. Four…. Three…. Two…. One…. As the opening credits rolled, a larger than usual studio audience applauded for this week’s episode of the William Paterson student run improv show, And Scene. Live from Studio A in Hobart Hall, And Scene had a special thematic episode on October 11. 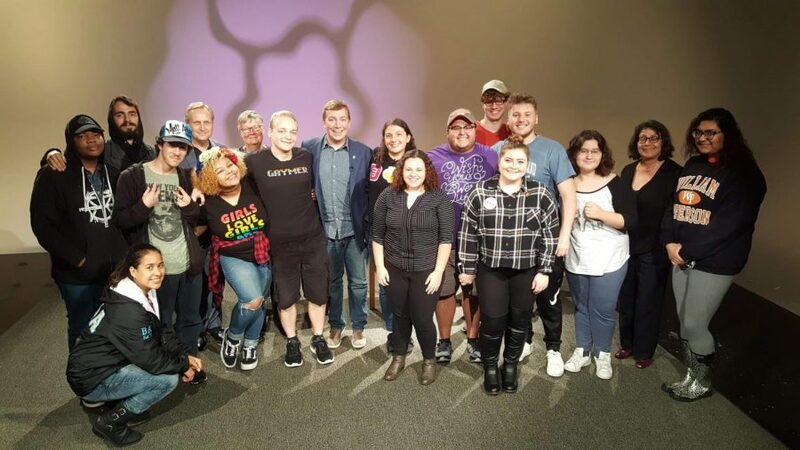 Concurring with Pride week, a LGBTQA+ improv show of And Scene was put on. The four performers represented the William Paterson LGBTQA+ community: Sam Cordero, Zachary Guida, Katie Stoerger, and Matthew Diaz. This episode was put together by the collaboration of Pioneer Players, an improv club, and the TV club, which filmed the episode. Senior Theatre and Comedy/English Writing major and Pioneer Players President, CJ von Essen, filled in as host for Joey Fatone. The format of the show has a series of improv games played by the cast members. The first game was a dating game. Sam had to choose between three secret potential dates. Katie played someone who was slowly coming out of a closet, Zach played as Elton John, and Matt played an individual that was in a committed relationship with someone named Kevin. Sam eventually chose Zach because she likes British accents. The next game played was Movie Mixer, where the cast members had to briefly act out two different movies. Some of the combinations were, The Rocky Horror Picture Show and the Dark Knight, Babaduke and Mulan, and High School Musical and Brokeback Mountain. After another break, an audience member was brought to the hosting table to hold up a bingo board, a ritual drawing that the show incorporated into every episode last spring. This week I23 was drawn. The topic associated with this ball was ‘Big Holiday Party’. The cast member proceeded to play a game called half-life, where after each interval, the scene would have to be performed in half the time. Each week, Pioneer Players holds biweekly meetings under the ballrooms from 7-9pm on Tuesdays and Thursdays. The club is also putting on a murder mystery that will be performed Nov. 9 and 10 within Hobart Manor. Episodes of And Scene are performed every Thursday in Hobart Hall, Studio A, at 5 pm.